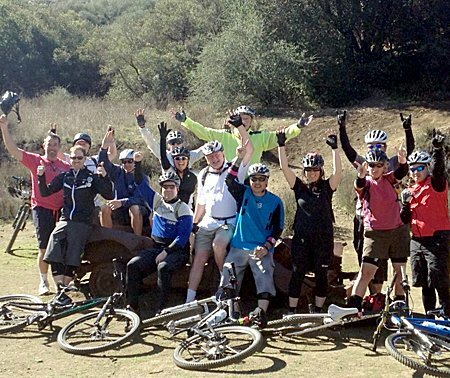 Riders from February's Beginner's Ride at the M*A*S*H site in Malibu Creek State Park. The next Beginner's Rides are March 3 and March 10. Why? Good Question! 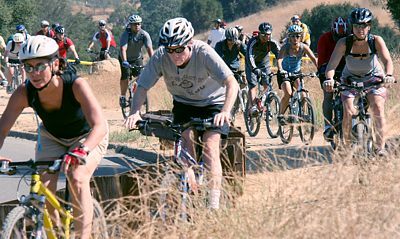 It was recently brought to our attention that newly elected president of Equestrian Trails, Inc. (ETI) Robert Foster, a retired law enforcement officer, donates his time as an emergency medical technician at So Cal High School Mountain Bike Racing League races. Mr. Foster is a staunch supporter of the league, and in his president’s message in ETI’s most recent newsletter he stated that it’s a new era in our public open space trail systems, and mountain bikers are part of the trail user community so we all should try to figure out ways to get along. Now I’ve been doing this advocacy thing for over 25 years, and I’ve experienced a lot of encouraging progress in the areas of shared use, especially when it comes to opening more trails to bicycle use. To hear the president of an organization that has historically had some of its members rally against mountain bikes say that we need to get along is truly groundbreaking. But things like this come fewer and more far between than I’d like, and during these 25 years I have often asked myself “why am I doing this?” The answer is always “because it’s the right thing to do.” This might sound insane (insanity once being defined by Albert Einstein as “doing the same thing over and over again and expecting different results), and in many ways this might be true. But then something like Robert Foster’s reasonable position comes along and I think to myself, maybe we have been doing the right thing after all. Over the years we have heard many reasons people feel mountain bikes don’t mix on shared use trails, but only one is valid; people riding their bikes too fast at the wrong time and place (around other trail users) is just not a pleasant experience for the people being passed at an inappropriate speed. As I’ve said many times before, we all have within our power the ability to solve this issue: slow down. In other words, use caution when around others. Let me put it another way; your actions represent the entire mountain bike community. The smile you create through a pleasant trail encounter goes a long way. The next Beginners ride will be from the beach side of Sycamore Canyon in Pt Mugu State Park on Sunday March 3. Details and sign-up. There will be a second Beginners ride on Sunday March 10. Details and sign-up. February 23: Report on Backbone Trail between Zuma Ridge and Kanan Rd. During a joint trailwork day, CORBA and the Santa Monica Mountains Trails Council trail crews cleared brush (lots and lots of it!) and fixed drainages on 2 miles of this 2.5 mile segment of the Backbone Trail. 15 CORBA volunteers grabbed loppers and saws to take on the overgrowing brush. It’s important to clear brush from the trail not only to keep it from becoming impassible, but also to increase the sight distances so approaching travellers can see each other and have time to react/respond to the other’s presence. In the case of mountain bikers approaching hikers or equestrians, this should mean slowing down and preparing to stop, if necessary, to yield the right-of-way. fter putting the tools away, CST tires were distributed to everyone who wanted one, as a “Thank-you!” from CORBA, IMBA and CST Tires for helping out. Then we retired to Ubane Cafe where CORBA bought lunch for all the volunteers. See our blog article for the full story. See our photo gallery for photos of the event. 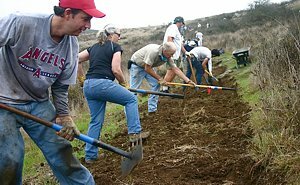 March 23: Conejo Spring Trailwork Day. Come out and join the Conejo Open Space Conservation Agency (COSCA) for the Annual COSCA Spring Trailwork Day. 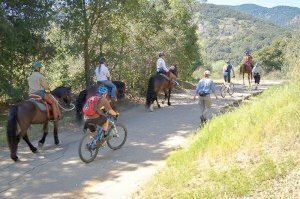 We will be bulding new trails in the Conejo Canyons Open Space. At noon, following the morning of trail-building, workers will be treated to hamburgers/vegi-burgers, chips, fruit and drinks while enjoying the camaraderie of fellow trail enthusiasts! Please register online for details and so we will know how many people to provide for. Sunday April 7th: Wenches with Wrenches workshop! This is the 1st of our series of FREE workshops for 2013. To be held at Pasadena Cyclery: http://pasadenacyclery.com/. Saturday April 27th: The next GGR OPEN ride! Beautiful Sycamore Canyon in Newbury Park. Open to ALL levels and beginners encouraged! A sign up will be available soon on the GGR Face Book Page. Sign up IS required. Sunday April 28th: GGR Girl Jenny Johnson is also doing a fund raiser to help raise funds for materials and tools desperately needed to maintain the trails in the San Gabriel Mountains! Read our GGR Update blog article for full details! Saturday March 2 is the next skills clinic.